Mike Walker was influenced by his father’s piano playing, his mother’s singing, and his brother’s guitar playing. He joined the jazz fusion band River People with Paul Allen, Tim Franks, and Paul Kilvington in Manchester. In the 1980s, he became a member of a quartet led by vibraphonist Alan Butler and worked with Michael Gibbs and Kenny Wheeler. He worked with Nikki and Richard Iles, then the Sylvan Richardson band, where he met saxophonist Iain Dixon. While in Zurich with the Kenny Wheeler big band, he met Julian Arguelles and joined his quartet. In the 1990s he toured in bands led by saxophonist Tommy Smith. 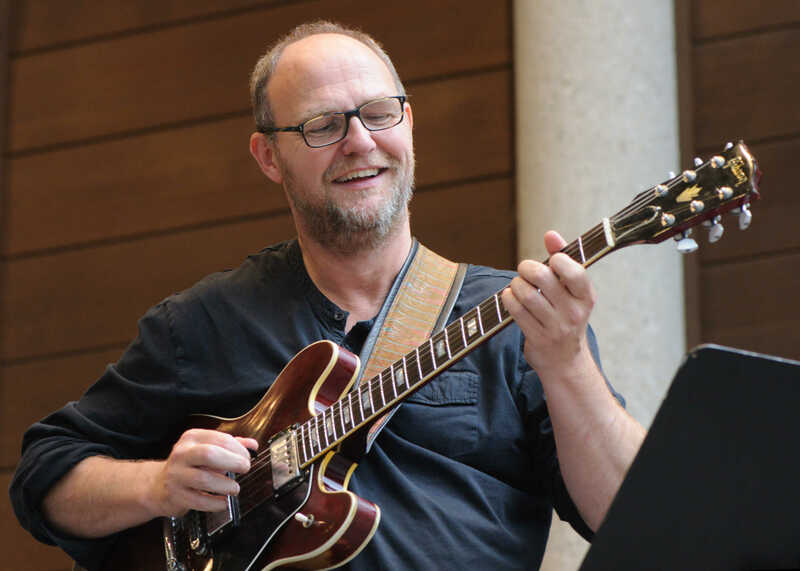 He has worked as George Russell’s guitarist, recording with him on several occasions, and with the Creative Jazz Orchestra, Arild Andersen, Tim Berne, Anthony Braxton, Jacqui Dankworth, Tal Farlow, Bill Frisell, Dave Holland, Vince Mendoza, Bob Moses, Palle Mikkelborg, Mica Paris, John Taylor, Mark-Anthony Turnage, and Norma Winstone. In May 2008, Walker released his debut album “Madhouse and the Whole Thing There”. It features the members of Brazil Nuts, plus strings and brass sections, piano, vocals, and French horn. Walker was commissioned to write a some music for Manchester Jazz Festival. He wrote a suite called “Ropes” that was performed by a 22-piece orchestra, a jazz quintet, and Adam Nussbaum on drums at the Royal Northern College of Music in Manchester.